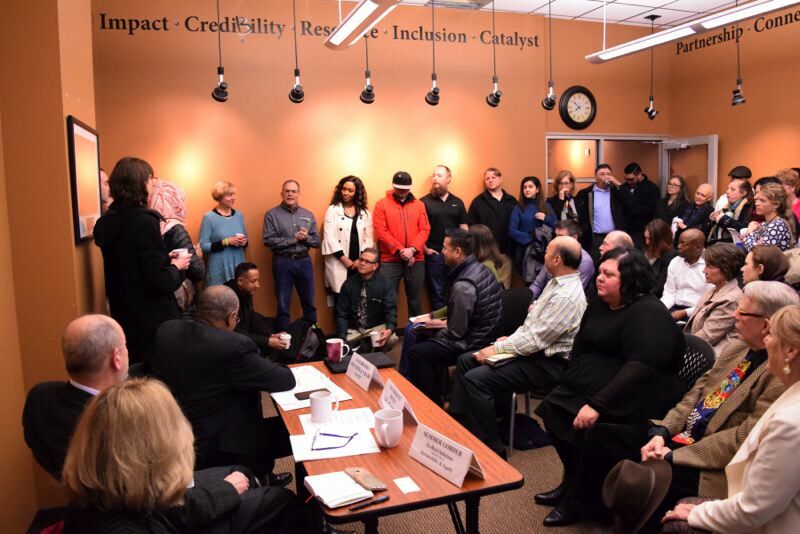 When the Oregon Association of Minority Entrepreneurs' leaders scheduled the organization's first meeting in Beaverton, they expected maybe 20 or 25 people to attend. Instead, it was standing room only, and the attendees snaked out of the Chamber of Commerce meeting room and down the hallway. It complicated things a bit given that Sam Brooks, OAME's founder and chairman of the board, has a long-standing tradition of asking attendees to introduce themselves and state what business opportunities they are seeking or providing. Yet, Brooks and OAME President Jorge Guerra made sure each person there had a chance to speak before the meeting began. "We've always been a statewide organization, but obviously the metro area is easier and closer for people to get to. We generally have about 200 people in our meetings in Portland, and that's at 7 a.m., so we expected a few people," Brooks said. "When it was standing room only (in Beaverton), that was pretty impressive." The inaugural meeting began with Beaverton Mayor Denny Doyle inviting Brooks to host a gathering after the two had attended several events together. OAME serves emerging small businesses owned by minorities, women and disabled veterans, and Brooks and Guerra knew there are many of those people in Beaverton. "One thing that stood out is that there are about 140 languages spoken in the Beaverton and Washington County area, but when we looked at all the businesses only about 30 percent are (MWESB) certified," Brooks said. 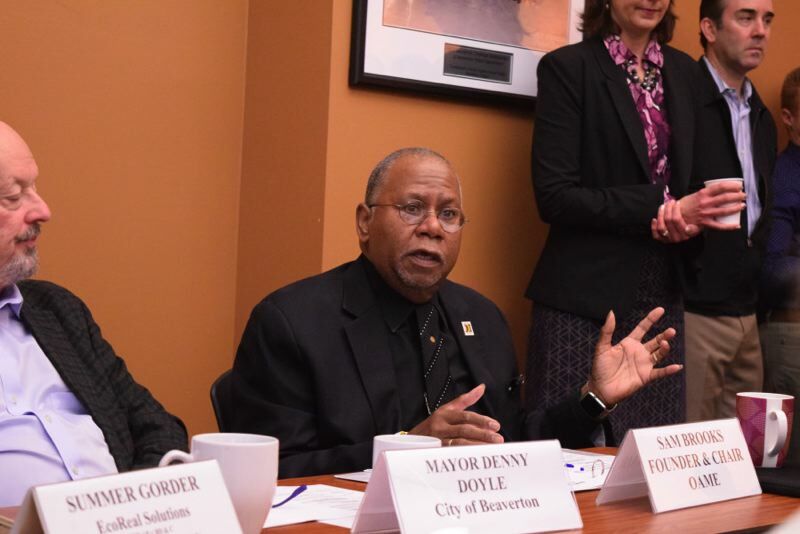 Guerra said Doyle kicked off the meeting by discussing opportunities for small businesses, and a conversation about issues of business equity and sustainability followed. Brooks noted that while the conversation about sustainability began about a decade ago, it has continued to evolve and many sectors now recognize that sustainability cannot exist without equity. Guerra and Brooks said that while OAME's website and social media helped Beaverton MWESB business owners know about the meeting, members of its Advisory Board spread the word as did OAME's network of members. Face-to-face interactions the day of the meeting aided in building rapport as well. "It works sometimes when people can see you firsthand," Brooks said. Meetings in Beaverton will now take place every other month, though a larger venue will be needed. Building on the expansion there, OAME plans to focus its growth into Southwest Washington as well, and the organization has added the Washington Department of Transportation to its Advisory Board. In addition, Guerra attends monthly meetings hosted by Salem Capitol Connections, a community of partners promoting economic opportunities for small businesses. OAME also collaborates with the Governor's Marketplace, which brings together industry professionals and leaders, public and private organizations, diversity and equity practitioners, and connects small businesses to tools and resources to start, sustain and thrive, according to the state's website. Brooks noted that OAME holds an international meeting every other month in which its members, who come from 60 different countries, introduce themselves in their native language. "They are happy to do it and proud of the countries they come from, and the other members enjoy hearing them introduce themselves in their own language," he said. As OAME celebrates its 30th anniversary this year and expands into new territory, Brooks said that the organization's motto — "Everybody's In, Nobody's Out" — remains a guiding light now more than ever. "It isn't that you can't get people to be inclusive, but for some businesses it doesn't come naturally and they need someone to step forward to lead them," he said. Formed in 1987, OAME is a nonprofit founded to promote and develop entrepreneurship and economic development for MWESB businesses as well as those established and operated by disabled veterans. The 850-member association is a collection of entrepreneurs, public agencies, partner nonprofits and large businesses. It mission is directed toward eliminating discrimination and racism.